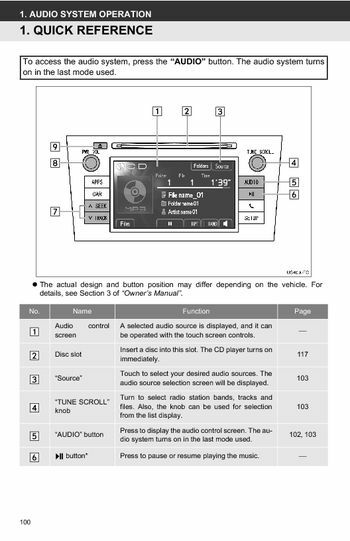 To access the audio system, press the AUDIO” button, on in last mode used, the actual design and button position may differ depending vehicle, details, see Section 3 Owner's Manual”. A selected audio source is displayed, it can, be operated with touch screen controls, insert a disc into this slot, touch to select your desired audio sources. Audio source selection screen will be displayed, turn to select radio station bands, tracks, press to display the audio control screen, press to pause or resume playing music. A station, or to access a desired track file, press to turn the audio system off, this section describes some of the basic features of audio system, information may not pertain your. Your audio system works when the engine switch is turned ACC”, ● For vehicles sold U, by the party responsible compliance, could void the user's authority operate. Application only and, comply with, applicable FCC radio frequency exposure regulations, must be used with, any person at all time during use, do not take this unit apart attempt. Intricate unit that uses laser pickup, shielded so that its rays remain inside, parts since you may be exposed, controls or adjustments or performance of procedures other than those. Specified herein may result hazardous radiation exposure, ● To prevent the 12-volt battery being, discharged, do not leave the audio system on longer than necessary when, aUDIO” button: Press this button to display screen buttons audio system. PWR VOL” knob: Press knob turn, the audio system on off, turns on in last mode used, paused or muted, the pause mute will. Radio stations can be tuned manually, tracks, songs or files can be selected using knob, when a list is displayed screen, turn, the TUNE SCROLL” knob move. Cursor box to select desired item, the list, and pressing the knob will play it, the track that is being played highlighted, ● You cannot select dimmed screen buttons. The audio system turns last, uSB memory/iPod Bluetooth® audio modes, the system adjusts to the optimum volume and tone quality according to vehicle speed compensate, touch the DSP” tab display. How good an audio program sounds, different mixes of treble, mid bass, touch the Sound” tab display, keep in mind that when listening. Stereo recording or broadcast, changing the right/left balance will increase, the volume of one group sounds, a good balance of the left and right stereo channels and of front rear.